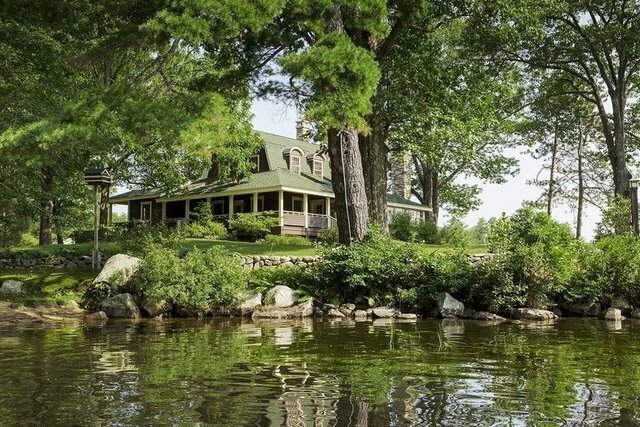 One of the last unspoiled 19th century Lake Winnipesaukee Great Camps- originally the summer home of the LePage family of LePage glue and later owned by the Lipton family. This remarkable parcel of land has 5.87+/- level acres with 641’ on the lake which includes a sandy walk-in beach, a large permanent dock with second story deck and a separate permanent deep water dock (14’ depth) with 13 slips. Boulder Lodge is the perfect family compound with a c.1840 four-bedroom, two-bath shingle-style home that has been restored and winterized. The classic style includes high ceilings, two fireplaces, a large wrap around porch and natural wood finishes throughout. There are five guest cottages with 1-3 bedrooms, three of which have grandfathered footprints where the front of the cottage is on piers in the water, a separate dining cottage with a state-of-the-art kitchen and attached covered outdoor dining area with a large fieldstone fireplace to gather around for family meals, and a media cottage. Just 15 minutes from Laconia Airport with jet service, one hour to Manchester Airport, less than 2 hours from Boston and 15 minutes to Gunstock Ski Area.